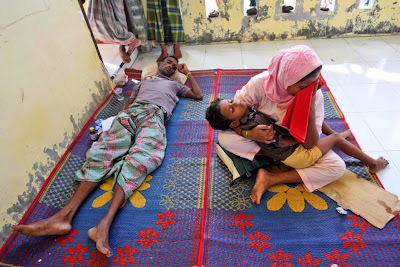 LANGKAWI, Malaysia — Rohingya and Bangladeshis abandoned at sea following a crackdown on human traffickers had nowhere to go Thursday after Malaysia turned away two wooden boats crammed with hundreds of hungry people. Thailand, too, made it clear the migrants were not wanted. "What do you expect us to do?" asked Malaysian Deputy Home Minister Wan Junaidi Jafaar. "We have been very nice to the people who broke into our border. We have treated them humanely, but they cannot be flooding our shores like this." "We have to send the right message," he said, "that they are not welcome here." Thai Prime Minister Gen. Prayuth Chan-ocha, meanwhile, said his country couldn't afford to host the refugees. "If we take them all in, then anyone who wants to come will come freely," he said. "Where will the budget come from?" He had no suggestions as to where they should go, saying: "No one wants them." Southeast Asia for years tried to quietly ignore the plight of Myanmar's 1.3 million Rohingya but finds itself caught in a spiraling humanitarian crisis that in many ways it helped create. In the last three years, more than 120,000 members of the Muslim minority, who are intensely persecuted in Buddhist-majority Myanmar, have boarded ships to flee to other countries, paying huge sums to human traffickers. But faced with a regional crackdown, some captains and smugglers have abandoned the ships, leaving an estimated 6,000 refugees to fend for themselves, according to reliable aid workers and human rights groups. Around 1,600 have washed to shore in recent days — a thousand on Langkawi, a resort island in northern Malaysia, and another 600 arriving surreptitiously in Indonesia. But nearly just as many have been sent away. And now food and water supplies are running low. "This is a grave humanitarian crisis demanding an immediate response," said Matthew Smith, executive director of nonprofit human rights group Fortify Rights. "Lives are on the line." Denied citizenship by national law, Myanmar's Rohingya are effectively stateless. They have limited access to education or adequate health care and cannot move around freely. They have been attacked by the military and chased from their homes and land by extremist Buddhist mobs in a country that regards them as illegal settlers. Despite appeals by the U.N. and aid groups, no government in the region — Thai, Indonesian or Malaysian — appears willing to take the refugees, fearing that accepting a few would result in an unstoppable flow of poor, uneducated migrants. U.N. Secretary-General Ban Ki-moon is "alarmed by reports that some countries may be refusing entry to boats carrying refugees and migrants," a statement from his office said Thursday. It said Ban urged governments in the region to "facilitate timely disembarkation and keep their borders and ports open in order to help the vulnerable people who are in need." 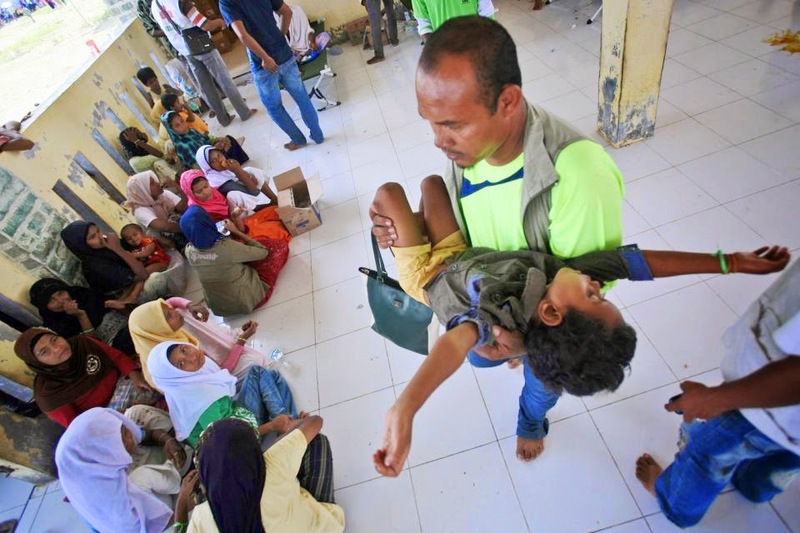 Days after Malaysia let in a few boats carrying around migrants, Wan Junaidi announced that a vessel carrying 500 people on a boat found Wednesday off northern Penang state were given provisions and sent on their way. Another carrying about 300 migrants was turned away near Langkawi island overnight, according to two Malaysian officials who declined to be identified because they weren't authorized to speak to the press. Indonesia's navy also sent away a boat carrying 400 people this week, giving them food, water and directions to Malaysia — the country migrants allegedly said they were trying to find. Phil Robertson of Human Rights Watch Asia accused Indonesia, Thailand and Malaysia of playing "a three-way game of human ping pong." Though Thailand has a "help-on policy" — give people provisions and then send them on their way — its navy got a green light Thursday from Prayuth's government to rescue a vessel spotted along the Thai-Malaysian maritime border in Satun province, said Jeffrey Labovitz, the International Organization for Migration's chief of mission in Bangkok, Thailand. The migrants had been begging for help by phone for days, but when sailors finally arrived, offering to bring them to land, they said they were fine. "None of them wanted to go to the Thai shore," said Maj. Gen. Sansern Kaewkamnerd, deputy government spokesman. "They said they wanted to travel to a third country." Chris Lewa, director of the Arakan Project, said relatives of some of those on board — including a 16-year-old boy — were crushed to learn their loved ones were not disembarking. She said they believe the decision was made by a person who appeared to be controlling everyone on the boat. Doksone reported from Bangkok, Thailand. Associated Press journalist Ali Kotarumalos in Jakarta, Indonesia contributed to this report.